If you’ve ever checked a surf report to know how big the waves will be for a surfing session, you have Walter Munk to thank. And those calendars that predict high and low tides? They wouldn’t be possible without the research from the legendary UC San Diego oceanographer. 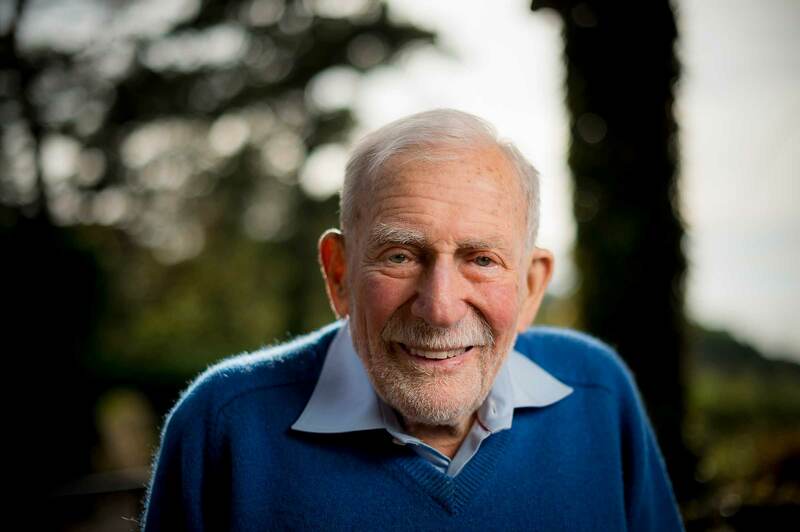 Born in Austria in 1917, Walter Munk joined Scripps Institution of Oceanography as a young doctoral student in 1939 in what would start a career of nearly eight decades of scientific discovery, daring science and transforming how the world understands the ocean. Scripps Oceanography became part of the University of California San Diego in 1960, making Munk – who turns 100 this month – the oldest living UC San Diego alumnus. The ocean science pioneer, whose commitment to bold, seafaring science is part of the fabric of UC San Diego, is being honored by the university at multiple events throughout October 2017. 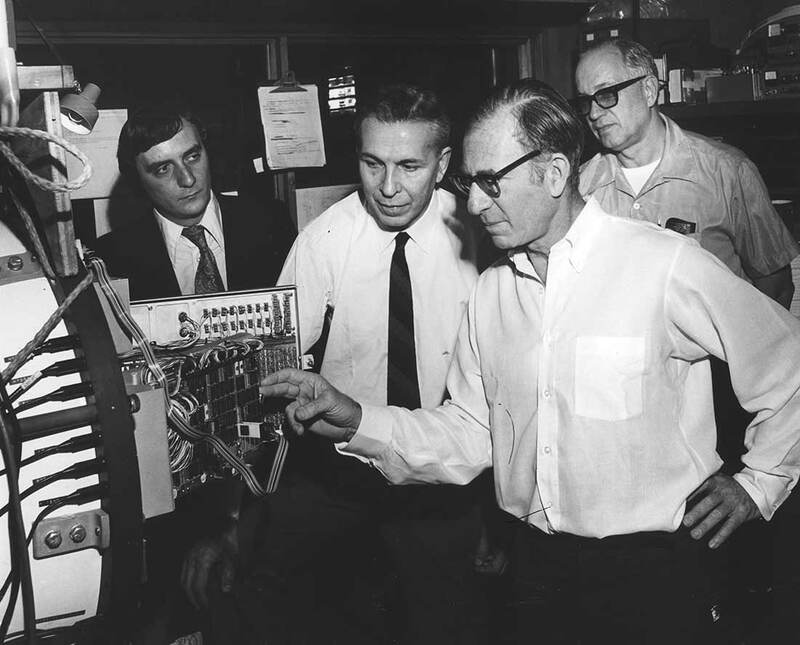 Walter Heinrich Munk (foreground), director of the Institute of Geophysics and Planetary Physics, viewing a recording system used in deep-ocean studies of internal waves with French dignitaries. Photo Credit: UC San Diego/ Scripps Institution of Oceanography. Often called the world’s greatest living oceanographer and heralded by the New York Times as the “Einstein of the oceans,” Munk is known for inventing the science of wave forecasting with former Scripps Director Harald Sverdrup. Their work helped the Allied troops plan amphibious invasions during World War II. In 1943, Munk created the first wave-prediction course and trained American military meteorologists at Scripps Oceanography, including those who would later predict conditions for the game-changing D-Day landings in Normandy. Munk also pioneered tide prediction and many aspects of ocean acoustics, ocean circulation and deep-sea tides. He conducted bold experiments around the globe that included trying to drill into the earth’s mantle near Guadalupe Island, Mexico (Project Mohole, 1957), and studying how fast sound moves through the oceans in American Samoa (Waves Across the Pacific, 1963). Project Mohole failed in its original goal, but revolutionized deep sea drilling. In an effort spearheaded by La Jolla community members and San Diego City Councilmember Barbara Bry, on Wednesday, Oct. 18 at 3 p.m., the boardwalk adjacent to La Jolla Shores beach will officially be named Walter Munk Way. The UC San Diego community is invited to the dedication ceremony, where the honorary street signs will be unveiled by UC San Diego Chancellor Pradeep Khosla, Bry, State Assemblymember Todd Gloria and California State Senator Toni Atkins. 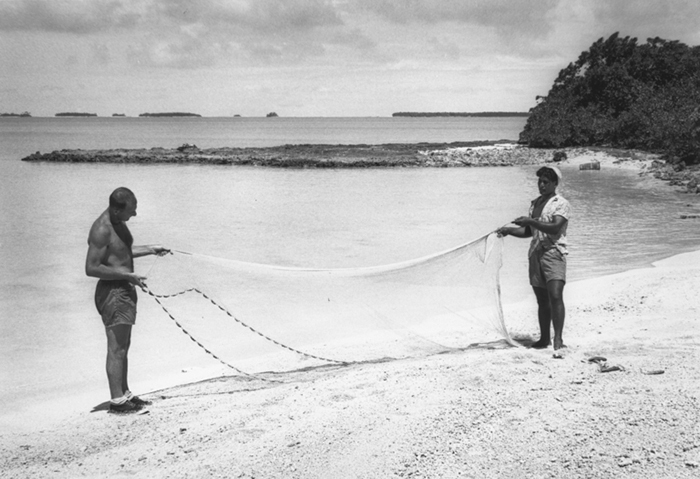 Walter H. Munk and native fisherman. Majuro Atoll, Marshall Islands. Capricorn Expedition, 1952. Photo Credit: UC San Diego/ Scripps Institution of Oceanography. Photo Credit: UC San Diego/ Scripps Institution of Oceanography. Following the dedication, the UC San Diego community is invited to join a cake reception at Scripps Oceanography’s Pawka Green to celebrate alongside Munk. On Munk’s actual birthday on Oct. 19, Birch Aquarium at Scripps will offer cupcakes to visitors in honor of his birthday, with a special visit by Munk planned for 2 p.m. The cupcake celebration is included with admission or free for members. UC San Diego students and staff are eligible for discounted admission with UC San Diego identification. On Oct. 26, UC San Diego will also welcome His Serene Highness (H.S.H.) Prince Albert II of Monaco to campus for a Centennial Conversation with Walter Munk at the Robert Paine Scripps Forum for Science, Society and the Environment at Scripps Oceanography. The conversation between Prince Albert II and Munk will be a dialogue on exploring the seas and the importance of oceanographic research. His Serene Highness Prince Albert II of Monaco, Walter Munk and Mary Coakley Munk. Photo Credit: UC San Diego/ Scripps Institution of Oceanography. The Principality of Monaco has a long history of ocean conservation that started with Prince Albert I, who financed and participated in oceanographic expeditions in the late 19th century and early 20th century. This tradition is carried on by Prince Albert II, who shares the same passion for scientific expeditions and is the only head of state to have visited both the North Pole and the South Pole. In 2006, he created the Prince Albert II of Monaco Foundation, dedicated to preserving the environment and promoting sustainable development. The Centennial Conversation with Walter Munk and H.S.H. Prince Albert II is invite only, however the event will be available to all via livestream at http://munk100.ucsd.edu. Despite decades of groundbreaking scientific discoveries and a long list of awards that includes the National Medal of Science (1985), Kyoto Prize (1999), Prince Albert I Medal (2001), Crafoord Prize (2010), Roger Revelle Medal (2013) and more, Munk hasn’t rested on his laurels. 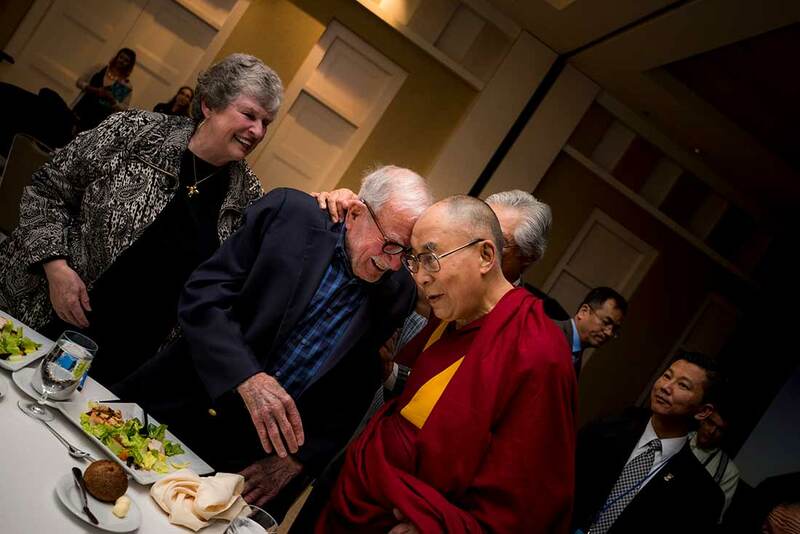 Dalai Lama hugs Walter Munk as Mary Munk looks on. Photo by Erik Jepsen/UC San Diego Publications. In 2015, Munk went to the Vatican for a four-day workshop on climate change, which was attended by Pope Francis. He also helped found the newly launched Scripps Center for Marine Archaeology, a collaboration between Scripps and UC San Diego’s Department of Anthropology to study the influence of marine environments on human cultures. Additionally, he’s part of a collaborative team at Scripps working on long-term ocean monitoring systems in the Arctic, and he’s currently conducting research to better understand how wind influences waves. Munk’s endless curiosity and commitment to getting out to sea to do research continues to inspire generations of UC San Diego students and faculty. Scripps scientists conduct research projects in every ocean and on every continent to continue to further understand our planet, and to find solutions to the world’s most complex environmental issues. Last year, a new Oceanic and Atmospheric Sciences undergraduate major was launched at UC San Diego, with much of the required coursework based on ocean science pioneered by Munk. It’s a fitting legacy for a scientist who has spent much of his career inspiring and educating the next generation of scientists. 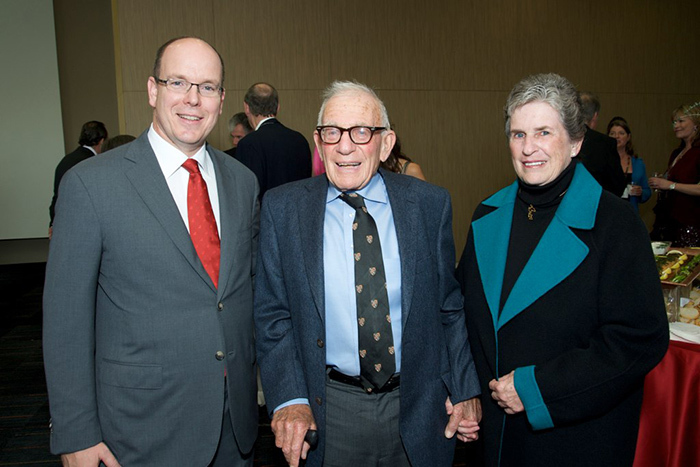 For more information on Walter Munk Centennial celebration events, or to submit a memory of working with or being inspired by Munk, visit http://munk100.ucsd.edu.